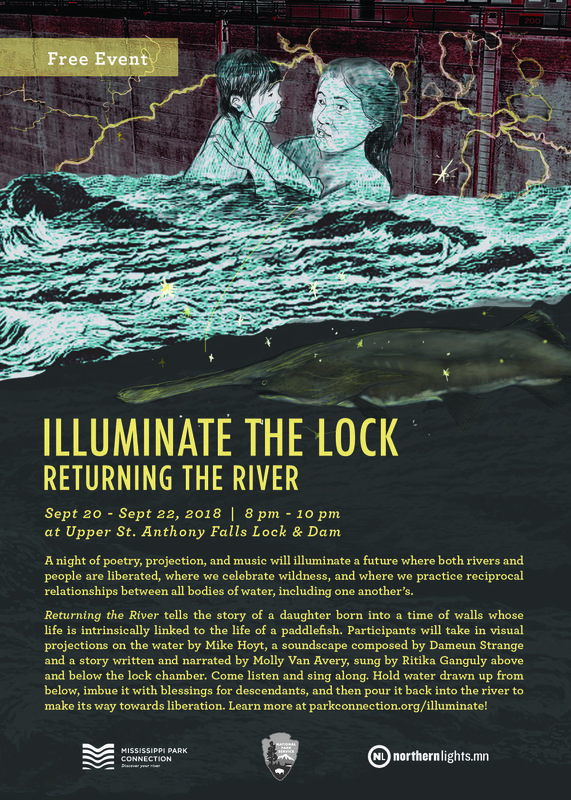 A night of poetry, projection, and music will illuminate a future where both rivers and people are liberated, where we celebrate wildness, and where we practice reciprocal relationships between all bodies of water, including one another's. Returning the River tells the story of a daughter born into a time of walls whose life is intrinsically linked to the life of a paddlefish. 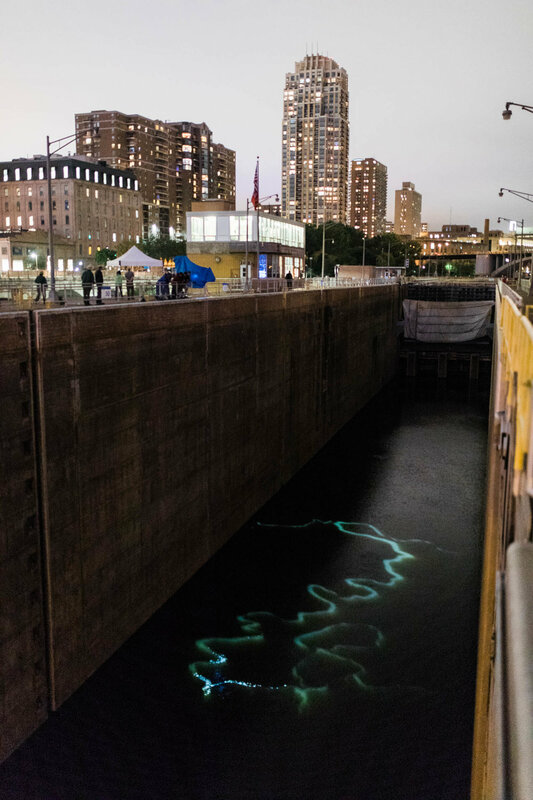 Participants will take in visual projections on the water by Mike Hoyt, a soundscape composed by Dameun Strange and a story written and narrated by Molly Van Avery from a boat in the Lock chamber and sung by Ritika Ganguly from above. Come listen and sing along. Hold water drawn up from below, imbue it with blessings for descendants, and then pour it back into the river to make its way towards liberation. 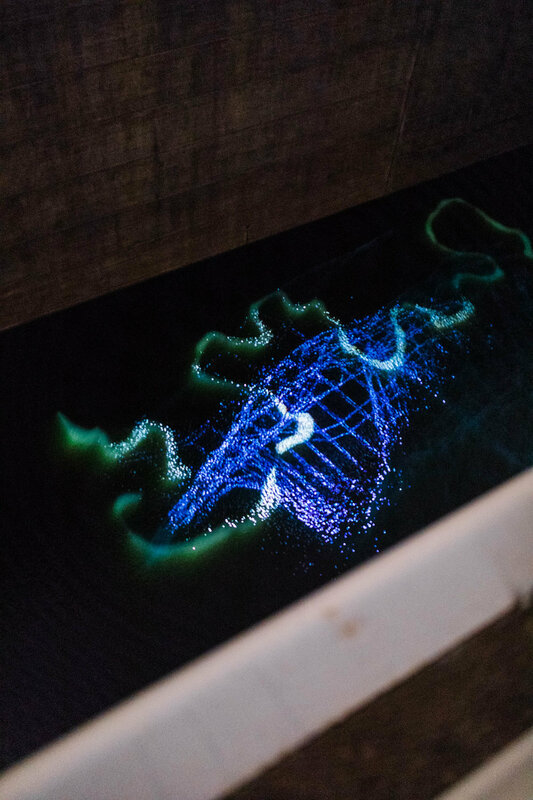 Aaron Dysart’s Surface took years of handwritten data recorded by Army Corp of Engineers staff as the basis for a light show. Daily pool heights translated into shifting colors projected on atmospheric effects created in the lock chamber. The spectacle displayed the 52-year operating history of this iconic Minneapolis space through near daily observations by the people who tended it. Andrea Carlson’s The Uncompromising Hand engaged Spirit Island, a limestone island and Dakota sacred site that was once in the Mississippi River near the current Lock and Dam. A hand–drawn animation based on six photographs of the island at the MN Historical Society’s collection that plot the island’s lengthy dismantling between the 1890s and 1960s filled one side of the lock’s long wall. Text in Dakota and Ojibwe accompanied the projection. 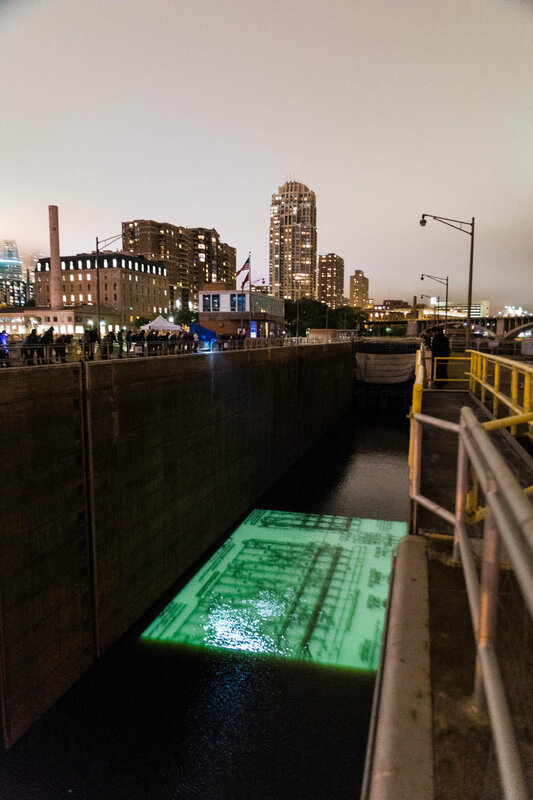 Illuminate the Lock is presented by Northern Lights.mn, Mississippi Park Connection, the National Park Service with support from St. Anthony Falls Heritage Board and the US Army Corp of Engineers.